Discussion in 'Iowa Whitetail Conference' started by MN Slick, Jun 15, 2018. Anyone using this type of scrape rig that Jim Ward builds? Every one I've put up has been hit hard. Bucks seem to like to be able to get right up under the limbs and work them over and of course they are great for inventory. I'll try to post some pics of bucks on mine when I get a chance. Here is a 100% guaranteed way to make a scrape. Go cut grape vines that are about 1" in diameter. They grow everywhere in the Iowa timber. Cut them as long as possible; you can trim them later. Take some tie wire that you buy at any hardware store (used for tying rebar) and attach it to one end of the grape vine. 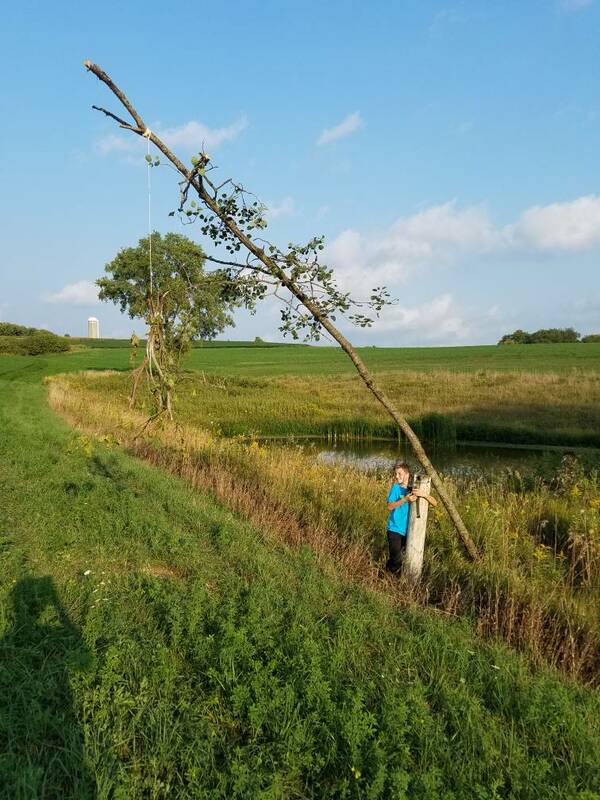 Find a decent spot you want the scrape and tie off the tie wire to an overhead branch (likely need a tractor, step ladder, etc). Trim the grape vine to 5' off the ground. Rake the ground to dirt below the vine. GUARENTEED there will be a scrape there. jjohnson, Muskrat24 and EatSleepHunt like this. Then take the extra woodiest part of the vine and smoke some meat. I did first one last year with a vine, it worked. I’m sure it’d work. Those bucks are not fussy. U find ANY area where u see a void of 4-6’ branches hanging - create one & they come. Good ideas above!!! Guys on here come up with awesome stuff - like the willow tree in the plot for rubbing - im all ears on learning from u guys on this stuff! Learning never ends! goatman and deep woods goat hunter like this. They don't take much time to put up. I try to get the wire installed in the spring then add branches and cut a whizz around Sept 1. I'm going to add a vine to one of mine and see if they show a preference to hitting it over the oak branches I've been using. Anyone ever use a dripper over a scape or put any of the million types of bottled urine on a scrape to help get them started? I used windpro (now called scrapefix) last year on my scrapes and the results were unreal compared to previous years of making mock scrapes. I had the same results, so the name changed? Yeah Windpro sold out. I can't remember who bought it. But they changed the name to scrapefix which was probably a smart move. Lot's of people had no clue what windpro was. Everybody thought it was just a wind checker. Hopefully the name change helps them with marketing. Regardless, it is incredible stuff! I use grape vines. They seem to hold up better than anything else. Location is key. If you can find somewhat of an opening and hang this in the middle they will go nuts. I was told to take a vine that has been used on farm A and swap with a vine from farm B and they really get pissed. Havent done it yet but I bet they get very territorial. This is one of my favorites. This thing got hit the day we put it up and everyday after that. Sligh1, bigbuckhunter88, Waukon1 and 1 other person like this. Great idea. I thought before about starting a "scrape exchange program" where you trade a scrape branch from your farm with one from a friends farm to really get them fired up! Never tried it though....might have to this year! A valid concern and one that I've considered. I run video cams on some and while I have had a button buck or 2 get up in there I don't recall any racked bucks doing it. Seems if the bucks can reach the limbs they don't need to get up on their hind legs. I actually expected to them to get up in there much more. What is the magic height for any of these mock scrapes? No magic height, just don't put it above what a buck can reach. I generally have my licking branch about 4-5 feet high.